This table was pretty easy to assemble and well made. I got it in green, and it was just as pictured. The chairs are comfortable, but I'm not sure how the fabric and stain will hold up in the weather. I would recommend using this set on a covered patio. 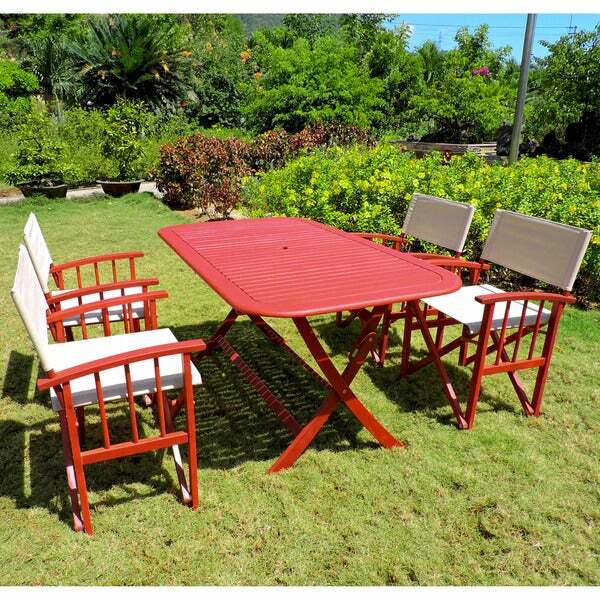 Add a splash of color and a touch of comfortable style to your outdoor furnishings with this dining set. This dining set is built with durable, long-lasting acacia hardwood and is available in your choice of three beautiful, colorful wood stains. easy assembly, sturdy and great looking. it took one hour to put this together, the wood is very sturdy. everyone in my family l;oves it. the directors chairs are comfortable and the whole set is very easy to store. I bought this set for the ease of closing it up during a hurricane. Put it together by myself. Unfortunately, I made one mistake but it was an easy fix. Chairs are comfortable. One of the legs was cracked. Folding set, easy to store during hurricane. "Can you buy the chairs without the table?"